1. A gastight and watertight joint formed by joining metal parts through a positive-holding mechanical assembly (such as flanged joint, screwed joint, flared joint). 2. 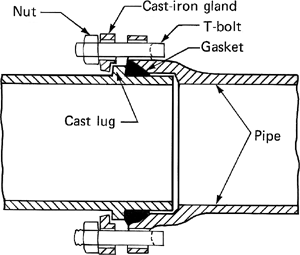 In piping, a joint which typically consists of: (a) a flange which is integrally cast with the bell of the pipe, (b) a rubber gasket which fits into the recess in the socket, (c) a follower ring which compresses the gasket, and (d) nuts and bolts used to tighten the joint. It is important to caution that gasketed mechanical joints on PVC and DI pipe will experience leakage. The static unit, however, was unable to overcome the difficult mechanical joints along the length of the cast iron pipe. and most pipe companies manufacture mechanical joint retainer glands for restraining mechanical joint pipe and fittings. The mechanical joint creates a triple seal due to the pipe groove, gasket and housings. The corrugated PE pipe used for storm sewers and highway drainage systems employs gasketed mechanical joints. Uni-Flange; and most pipe companies manufacture mechanical joint retainer glands for restraining mechanical joint pipe and fittings. Tenders are invited for stiffener for 1" polybutylene tubing; ductile iron pipe, 24" tyton push-on joint; compact ductile iron bend, 8" mechanical joint x 8" mechanical joint, 22 1/2 degree; 1" ips socket fusion tee; bell joint clamp for 24" ci/di pipe; 3/4" x 6" pipe repair clamp; combination air valve. Ductile iron or cast iron mechanical joint fittings and ductile iron push on type fittings can be installed directly onto Duraliner, using the standard M.
Sluice Valve With Mechanical Joint as per IS Specification Complete Work With labor and Material as Per Attached Schedule of Quantity Ward No. Pipe Line by Mechanical Joint Complete work with Lobour and Material Etc.